A sixteen-year-old girl is at the centre of an ugly row in Fiji over her suitability to represent the country in the Miss World competition. Torika Watters is a mixed race European/ indigenous Fijian – known locally as a Kailoma – who beat a field of full-blooded indigenous and Indo-Fijian contestants to win the Miss World Fiji crown. There’s controversy about whether a sixteen-year-old should have been allowed to enter the competition in the first place, with the Fiji Times branding Torika the “baby queen”. But that controversy has been overshadowed by a bigger argument over her racial characteristics and “non-Fijian” appearance. Ever since she was crowned last weekend, Torika has found herself dissected – some might say eviscerated – on both the “coconut radio” of local gossip and social media such as Facebook. Why? Incredibly, because of her “European” looks and the fact that she doesn’t look “typically Fijian”, presumably without the broad nose and fuzzy hair of an indigenous i’taukei or the lithe sultriness of the descendant of a transplant from the Indian subcontinent. Evidently, her crime is to be simply too white in a population with a typical colour spectrum ranging from cafe latte to strong black. The debate goes to the heart of the continuing obsession with race in Fiji that has always thwarted the country’s social and political development. The truly disturbing aspect is that deep-seated racial prejudice doesn’t seem to be the preserve of uneducated backwoodsmen. Some of the more overtly racist comments in the Miss World Fiji furore have been made by Facebook contributors who are both internet savvy and relatively affluent, including a prominent Suva lawyer. Racial division has produced three of Fiji’s four coups since independence. The fourth – Frank Bainimarama’s 2006 takeover – was largely anti-racial, an attempt by Bainimarama to enforce equality and declare every citizen a Fijian for the first time. Yet if anything, the Miss World fracas shows that while the regime may be able to formally enforce equality at the point of a gun, it can’t legislate against entrenched ethno-nationalist attitudes and blind prejudice. The Facebook row over Torika’s win has even extended to a debate over hair, with some contributors saying that any Fijian Miss World should sport a buiniga ( a frizzy i’taukei style ) over the winner’s flowing western-style locks. Then there were complaints about the way indigenous people were portrayed on stage, with allegations that the i’taukei girl sitting at Torika’s feet and the warrior with the club by her side presented a demeaning image to the world of Fiji’s original inhabitants. Some have even seen a white conspiracy in the choice of Torika over indigenous and Indo-Fijian contestants. The chief judge was Rachel Hunter – the New Zealand supermodel and former spouse of rocker Rod Stewart – who was joined by Fear Factor USA grand champion Mark Hewlett and a clutch of local judges, none of them of purely indigenous descent. While this may have been unwise under the circumstances, was it a “white stitch-up”? Surely only the most racially motivated would see any conspiracy. Many Kailoma in Fiji have long felt they occupy something of a netherworld – neither European nor Fijian – and the Miss World row has stirred some deep-seated sensitivities and even feelings of rejection. In the way of mixed race people the world over, many of them are physically attractive – combining the best attributes of both – and are therefore more likely, perhaps, to conform with conventional western stereotypes of beauty. This is undoubtedly so in the case of Torika Watters. So are her critics motivated by racism or merely a latent sensitivity that expressions of their own racial characteristics aren’t being properly acknowledged for their own undoubted beauty? Either way, it’s been an ugly spectacle at a time when race is again at the centre of the national debate in Fiji, with hotly-contested claims by a paramount chief, Ro Teimumu Kepa, that indigenous Fijians are again being disadvantaged over other races. The sole comfort to be derived from this sorry episode is the outcry on Torika’s behalf and the equally furious denunciation of the critics of her win. As one Kailoma supporter told Grubsheet – “At least we now know who some of these racists are. Before they pretended to be our friends and said these things behind our backs”. What effect will all this have on the psyche of a sixteen-year-old, who is still a student at the Nadi International School ? That’s been the immediate concern of Torika’s family and friends. But there’s a wider concern about the pressure that will inevitably come when Torika goes to the Miss World pageant in Mongolia later in the year. Because the events of recent days make it almost inevitable that she won’t just be just another entrant but the standard bearer for a multiracial Fiji. Torika is a winner by far, and she will represent Fiji very well. Problem with Fiji people in general is that, they can not see anyone else do well and use race card to push their agenda. Hahaha! Here it comes again! Racist! Thats what we call na! Let me put another example of the plights by some races in Fiji…. a situation where NLTB would give tenants a quarter acre of land for yearly rental of 250.00, a smaller piece of land would be rented by ITaukei to other races of under privileged status for 600.00 per year. What would you say to that?? We are all concerned about Ms Watters being racially discriminated or prejudiced for having a ITaukei name but looks nowhere ITaukei. Can an Indian have a ITaukei Name? Can a Kaivalangi have a ITaukei name… we all know ITaukei names have a mixture of Christian name and ITaukei name… But my concern is if Fiji is equal to all other countries, have a compliance and contingency plan, then will the activists who prophesise such hatred in speeches, and in gestures,… accept Indians having names such as Qarase, Vakatora, Mara, Butadroka, .. Can we register such names? I have never met an Indian with an ITaukei name…. Coming back to Miss Watters, she was just given a taste of her first discrimination – that she is not indigenous.., there is many more to come by her way… especially if there are activists existing that takes defeat by discriminating… using minority race as trump card of being indigenous. We need to Evolute.. and so does indigenous. Being indigenous stops the mind and values stuck to one era, they cannot think of next 100 years..
Miss Watters is a Fijian by any means.. she has all the rights to be called a Fijian… She has Itaukei name but she doesnt look ITaukei… does this disqualify her from representing Fiji?? Activists should argue to send an ITaukei judge for such events, and not hinder the aspiration of the youngster who has greatly worked to be an ambassador of Fiji Islands. Such activists only creates division in our society that leads to more gruelling thoughts in some fanatic ITaukei. I hope you can help me in this one..My 3 cousins were born and bred here in Fiji, their mum is full Fijian and their dad is from Tailevu but from the Heritage family. When one of my cousin sister applied for FSN she was labelled as OTHERS & not a FIJIAN. She has frizzy “buini-ga” hair and so is everyone else. Its only their surname that’s make a difference. Why is that so? Its really confusing. According to the judges the best Fijian won. Torika make Fiji proud for all it’s people. Many Fijian (taukei) women have opted not to go with a ‘buiniga’ …hair straighteners and gel is big business in Fiji now. So whats the big deal with the ‘buiniga’?. Methinks the kerfuffle over Torika’s flowing locks is being pushed by male taukei traditionalists who (as usual) want women to conform to their standards. Gender equality is the issue. Stand up for your rights sisters ! Congratulations Torika Watters, such a beautiful ambassador to represent Fiji at Miss World. She has it all – the looks, character, class, knowledge and social skills. And she has the passport and heritage which makes her Fijian. There was no mention of a “buiniga” in the conditions of entry I’m sure. So what’s all the hooha about? Go for it Torika!! Do not be destratcted by all these views and negative comments by such narrow minded critics.As for Rukshar Khan i have a little nephew who is Indian and his got an i taukei name ( Dau ) and he speaks my village and island dialect quite well so whats the big deal? My friends call me Rusi!.. But that doesnt mean I am registered with that name. Anyways.. i am not negative minded.. at all! What I professed was that some Activists dont see beyond their barriers namely those that objected to Torika’s win. I see Torika as an european girl, “vasu i viti” and not a “kailoma” which does not really sounds right to me. Correct me if Im wrong, because that’s to my own understanding. I have no idea at all that there’s so much talk about her for taking the crown and i think she’s too young for all these stuff BUT i found her to be a great speaker..DAMN! Kaiviti, this just demonstrates your racism. 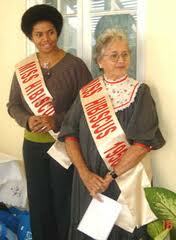 Torika has a European father but a kailoma mother from the Hazelman family of Savusavu. So they are part i’taukei. But more importantly, she is a FIJIAN whether you like it or not. You stay in the past, if you want to, but there’s still time for you to catch up with your attitudes before you and your kaivata get left behind.